The "second part" of our regular May 2016 OSSC meeting will be on Saturday, May 21, 2016: a "behind the scenes" tour of the orchid greenhouses at the Huntington Library, Art Collection, and Botanical Gardens. 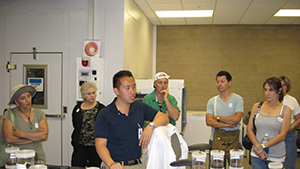 OSSC members in good standing are invited to join us in a tour guided by Brandon Tam, the Huntington's Orchid Specialist. (You can check out Brandon's orchid-oriented blog here.) All members, their spouses and partners are welcome on this tour. Members need to meet at the ticket booth at the front entrance of the Huntington at 9:30am sharp, where a ticket to the grounds will be issued. Once the administrative work is completed, we will walk to the greenhouses at 9:45am for the 10:00am tour. (It takes about 15 minutes to walk to the greenhouses.) 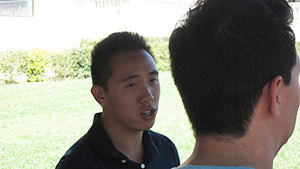 The tour will take between 2 and 2.5 hours, after which members are invited to have lunch at one of the five restaurants on the Huntington's ground (OSSC webmaster's two cents: while all are great, the Chinese Garden Tea House rocks!) or bring your own. Afterwards, members are invited to spend the rest of the afternoon wandering about the grounds and/or buildings. All members with OSSC badges should wear them, and don't forget to wear comfortable shoes! The Huntington Library, Art Collections, and Botanical Gardens is located at 1151 Oxford Road San Marino, CA. An interactive map with directions is found below. Brandon Tam has been growing orchids since the age of 7 starting with a white flowering Cymbidium his grandmother gave to him. She has been the source of his inspiration to further his studies within the botanical world and pursue a career within that field. She would bring him to their local nursery where she would let him pick a plant each time they went. 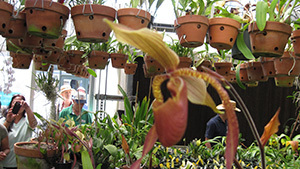 Over time, not only did his orchid collection grow, but his knowledge in that field did too. At the age of 14, he began volunteering at The Huntington Library, Art Collections and Botanical Gardens where he helped out among the different areas of the institution. From tending to the plants of the Conservatory to database entry of pressed specimens in the Herbarium, there were always plenty of opportunities to quench his thirst for plant knowledge. When Brandon turned 16, he graduated from high school and began attending college. 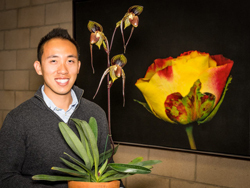 A few months after graduating high school, the Director of the Botanical Gardens at The Huntington offered Brandon an internship within the Orchid Department to reorganize and perpetuate the collection. He graduated from the California State University, Pomona with a Bachelors in Plant Science degree. Currently at the age of 22, Brandon is an Orchid Specialist focusing mostly in Paphiopedilums since a large chunk of the collection at The Huntington consists of that specific genus. Overseeing a 16,000 plant collection is no easy task but Brandon manages to get it done, in addition to receiving 5 FCCs from the American Orchid Society in the past 2 years. . From hybridizing new plants to the propagation of rare and endangered species, it is a high priority for The Huntington to further the advancements of plants within the Orchid world. At the moment, Brandon is working on the conservation aspect of the collection while collecting and adding more rare orchids to The Huntington’s fast growing collection. He stays active in the orchid world by being a member of 7 different orchid societies located all over Southern California while being on the Board of Directors at The San Gabriel Valley Orchid Society. Brandon’s participation in the orchid world is very limited at the moment due to his busy schedule working full time. In 2015, Brandon took on the position of Show Director of The Huntington Botanical Gardens International Orchid Show. He will be managing this show again this year and will be hosting the AOS Members' Meeting in conjunction with the Huntington Botanical Gardens International Orchid Show.